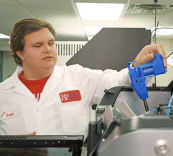 Milwaukee School of Engineering (MSOE) encourages its students to push forward and keep never stop learning, which is possible thanks to its Additive Lab Consortium members. With a focus on applications development, education and training, MSOE is more than an additive lab. The students work with businesses to solve unique challenges focusing around new product development. 3D printing materials are a focal point for many conversations. The 3D printing lab has the ability to support numerous additive technologies supplied by Stratasys, allowing them to pick the right material to solve any business problem.